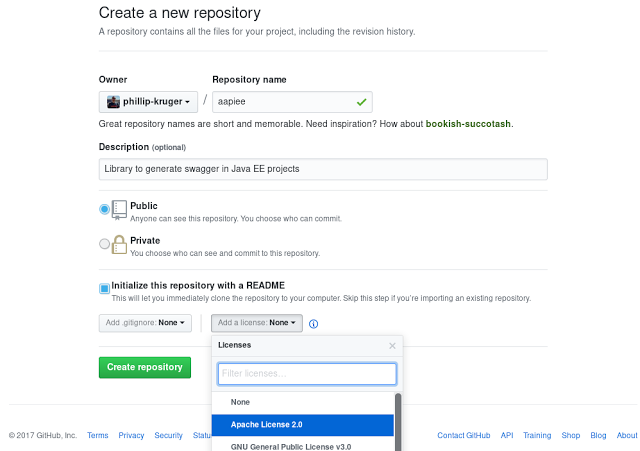 If you, like me, have some small open source projects or libraries, that you want to release to maven central, and you do not want to host your own CI environment, then this blog post might help. I mostly wrote it for myself (to remember) but I am sure it might be useful to others. All this information is somewhere on the internet, this blog just brings it together. So you have some projects on you PC, coding in your favorite IDE (Netbeans in my case) and you can build your artifacts in maven. 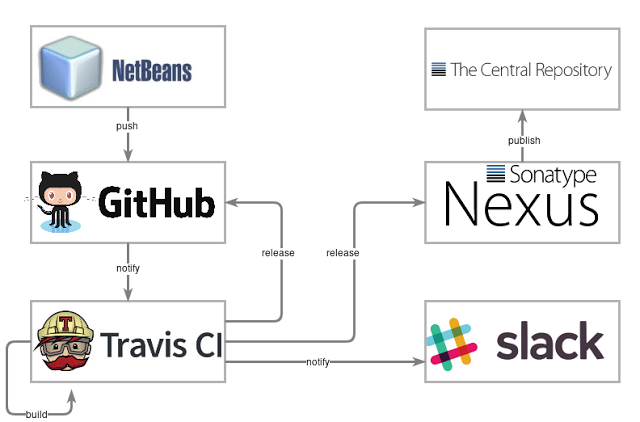 This blog will explain how to get from there via GitHub to build on Travis CI, create a release back into GitHub, release to Sonatype Nexus OSS and publish to the Central repository, and then send a slack notification. 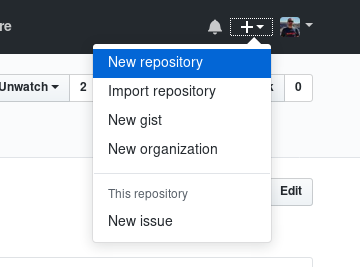 You can now clone the repository and add your code to it. 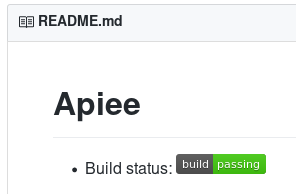 Add a README.md with some information about your project. GitHub also has a built-in wiki (example) to add more documentation about your project. Click the Configure access and follow the instructions. So now Travis built your project on every push. 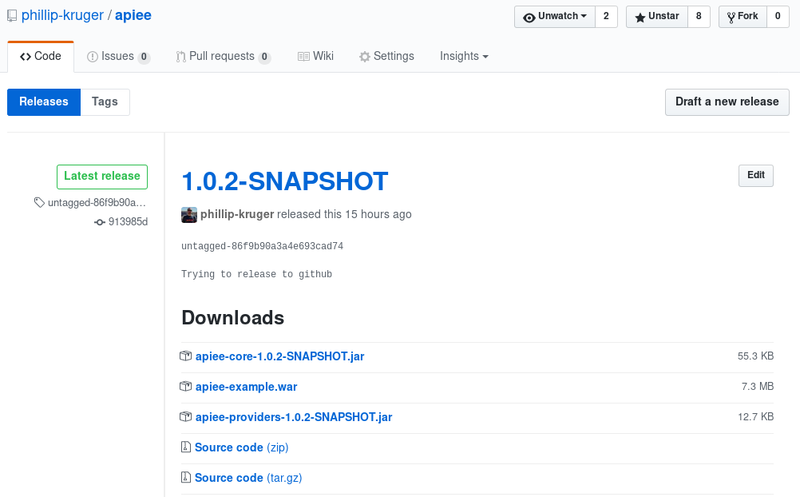 We can now setup Travis to create a release in GitHub for every build. This will allow you to create some entries in your .travis.yml file. You can replace the version in the file with the $project_version variable as set above. Also add a name for the tag. In my case I just used the project version. If the generated deploy part does not have the skip_cleanup part, add that. Commit and push, this will kick of a build in Travis and a new release in GitHub after a successful build. All the files as defined in .travis.yml will be available for download. 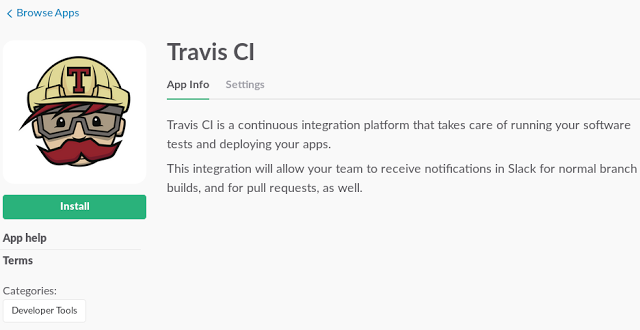 There is no way (at least that I could find) to release directly to Maven Central from Travis CI. The way that we will do it is via Sonatype OSS and using maven. Create a Sonatype User account. Make sure your Group Id and other pom details is correct. Go to Create your JIRA account and create an account for yourself. 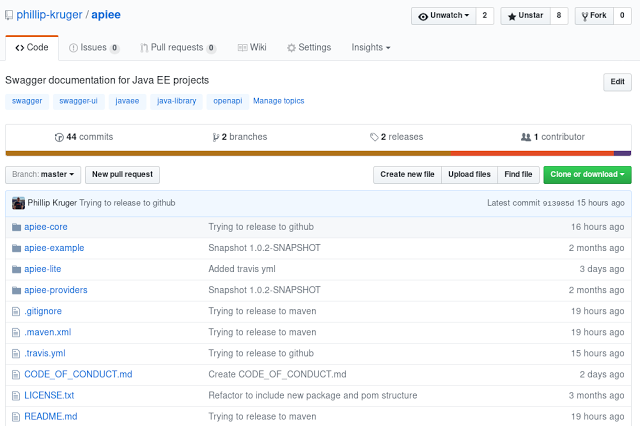 Just explain in the description that you want to publish your open source projects to Maven central. This takes a day or two, and then you can publish. 2) Make sure your Group Id and other pom details is correct. While you wait for the staff at Sonatype to get back to you, you can make sure your project is correct. Remember to update other references to your artifact in other poms or dependencies. Replace your-jira-id and your-jira-pwd with your own sonatype jira id and your-gpg-pwd with the one created above. This also means your artifact can now be included in any pom.xml !! We need to define the variables that we used above in the .maven.xml file on the Travis CI site. Click on “Access User Token” to get a user token. This will give you values to use in the SONATYPE_USERNAME and SONATYPE_PASSWORD values. GPG_EXECUTABLE will be gpg and GPG_PASSPHRASE will be your GPG password you create above at “Create a GPG certificate”. What about the local GPG certificates ? On your local PC you have create the GPG certificates that allow you to sign the artifacts when building. We now need to transfer these to Travis CI so that the build there can do the same. To do that we need to create base64 encoded values of the secrets and add them to Travis CI as environment variables. Add the output to a env variable called GPG_SECRET_KEYS in Travis CI as described above. Add the output to a env variable called GPG_OWNERTRUST in Travis CI. We can now update the .travis.yml file to build using our defined maven profile. This should do it. If you commit and push your code that contains your new .maven.xml and changes to .travis.yml, your build will now run under the release profile that publish to maven central. After your setup you can create a channel for build notifications. I called mine #travis. In your slack menu (on the left) Select the + next to Apps to browse and search for apps. Find the travis app and install it. You can then select the channel you created earlier. You will then see instructions on how and what to add to your .travis.yml file. Commit your change and soon you will get the notification ! That’s it. 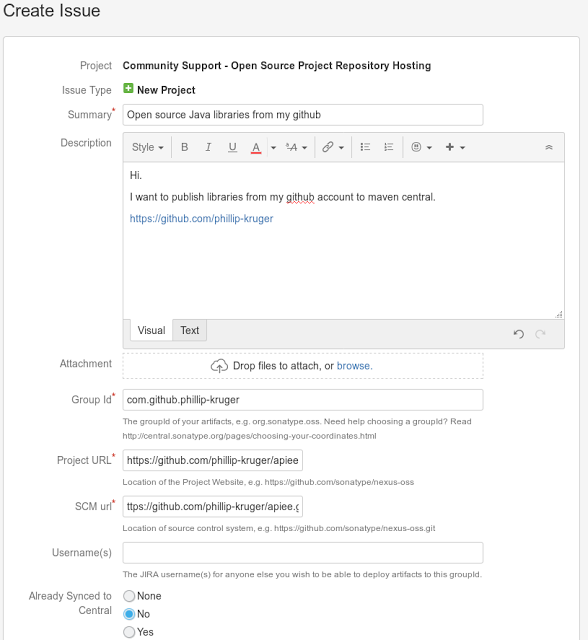 Now when you commit and push your code to GitHub, it will create a release in GitHub, publish to SonaType OSS Nexus and release to Maven Central, before sending you a slack message.